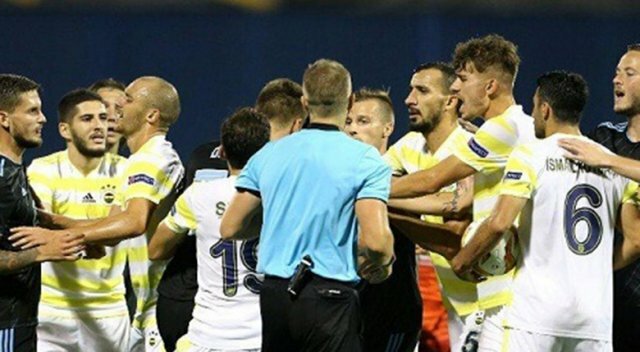 Turkey's Fenerbahce was defeated by Croatia's Dinamo Zagreb 4-1 Thursday in the first match of the Europa League 2018-19 group stage. The UEFA Europa League group stage began today with 24 matches. Fenerbahce began the group D match at Stadion Maksimir in the Croatian capital Zagreb with less possession than their opponents. Dinamo Zagreb's Ivan Sunjic put the hosts in front with a low shot from outside the box and Izet Hajrovic scored Dinamo's second goal in the 27th minute. Fenerbahce’s only chance to score in the first half came when Ismail Koybasi was awarded a free-kick. The Yellow Canaries kicked off the second half with a header by Roman Neustadter in the 47th minute to close the gap to 2-1. Hajrovic scored his second goal and put Dinamo Zagreb at 3-1 in the 57th minute while Dani Olmo made it 4-1 in the 60th minute. The teams met for the first time in the UEFA competition. Dinamo Zagreb won the domestic league and cup in Croatia last season while Fenerbahce were league and cup runners-up in Turkey. The first two teams from 12 groups will reach the last 32 round of the Europa League. The final will be held at Baku Olympic Stadium in Azerbaijan on May 29. Turkey's Galatasaray, the Lions, are the only Turkish club that won the cup, in 1999-2000.